Read from August 31, 2018 to September 7, 2018. Winner of the Pulitzer prize in 1921, Wharton’s talent has continued to be celebrated with her widely cultivated novels. I first read Wharton when I was in university with The House of Mirth, a book I did not expect to like but became enthralled with the writing style and characters. While many of Wharton’s books are about unhappy marriages, what continues to make them so popular is Wharton’s fantastic prose as well as an in-depth analysis and commentary on women in society. Newland Archer, a man living in high-class society New York in the 1870s, has recently become happily engaged. May Welland is well-suited to him and the two of them appear to be the perfect match. However, Newland’s whole foundation is shaken as he makes the acquaintance of May’s curious and beautiful cousin, Countess Ellen Olenska. Ellen has become the scandalous talk of the town as she has abandoned her very wealthy husband in Europe. In all appearances, she seems to be attempting to walk away from a perfectly matched marriage that has made her a Countess and very wealthy. However, she is willing to sacrifice it all. Newland is entreated by May to be kind to Ellen and to make her feel comfortable in New York as well as advising her legally, that she should not file for divorce or risk losing everything. Headstrong, Ellen does not seem to care for the societal rules in New York and brushes them off as having been raised with European customs. Newland soon learns that Ellen has her own set of ideals and above all else, yearns to be free. Without meaning to, Newland falls hard for Ellen as he begins to question his own feelings for May, his own identity, as well as the basis and cultural rules of the society he lives in. Women wanting to be free, it is that very theme that keeps women, no matter what the ear, coming back to books like this. While things may have changed and have improved for women since Wharton’s era, many men and women, still feel trapped by certain aspects of society and by what is expected of them. Society is so prominent in this book it is the antagonist. It is a character in and of itself. Wharton does a phenomenal job of drawing you into this superficial life and then shatters it for you like she does for Newland’s. Ellen shows Newland the other side of society, what its like when you don’t fit it and once that facade is broken there isn’t any going back. The characters and their inner dilemmas stay with you long after you have finished their story. This is truly a beautiful book and if anything, should be read and marvelled for its prose. I would recommend this book for anyone who has ever wanted to read Wharton and doesn’t know where to start, prose-lovers, classics-lovers, romance lovers and historical fiction lovers. Read from January 21 to February 05, 2013. Forgive the brevity of this post, I’m in the middle of moving so my time is a bit short these days. I’ll be better for next week! 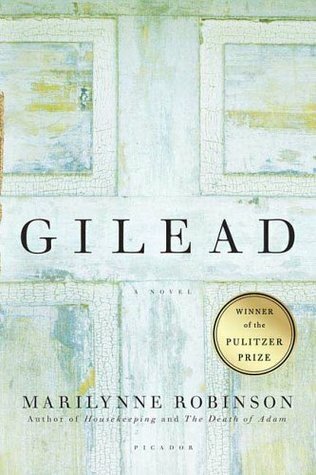 Here’s a throwback review of the Pulitzer Prize winner, Gilead. I’m still in some ways, not entirely sure what I want to say about this book. I never would have imagined that reading a journal about a minister’s life would be so intriguing. The book follows the memories and experiences of Congregationalist minister John Ames who grew up in the town of Gilead, Iowa. He is recounting his life for his son so that he will have something to remember him by as he is dying of a heart condition. The book touches on the human condition and the different relationships between a father and son as well as tensions in regards to faith and religion. The book itself is a showcase of appreciation for beautiful ordinary things and learning to be grateful for them. The writing style is extraordinary. Robinson is definitely up there with some of the classic authors with her style and voice. I enjoyed the letter and journalistic style of this novel as well as the depth each character was portrayed. The sadness of a dying father writing a letter to his young son, in contrast with the contemplation of the John’s own life, relationships and religion is really enveloping. I’m interested to see what the corresponding novels to this are like because while I enjoyed this book I feel as if I’m missing a piece of a puzzle in which I can make out the picture but I’m missing some of the details. Phenomenal writing and definitely worth the award that it received I would recommend this novel to anyone in a pondering mood.